I have never found a Topical Bible as thorough as “Truth Gathering.” It is incredibly complete and Ms. Quesinberry’s notes make even the Kings James Version Bible easy to understand. It is wonderful to be able to read EVERY scripture concerning a subject all in one place. 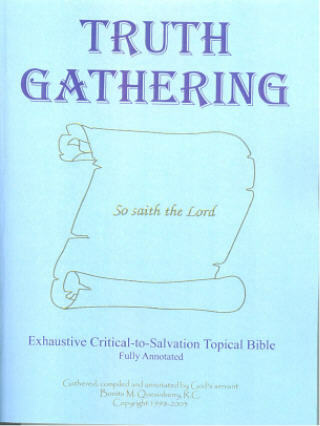 “Truth Gathering” is a 5-Star must for every serious Christian seeking only God’s opinion. When I first thumbed through “Truth Gathering” I must have sounded like a broken record, “Wow! Oh, my gosh! Wow! Oh, wow!” It is an incredible volume of work so complete it astounds me and can’t begin to convey the awe I felt. It definitely reflects Ms. Quesinberry’s 30 years in research and study as well as the five years it took her to write this Topical Bible. It’s unlike any I’ve ever seen! It should be in hardback. I’ve always felt overwhelmed and inadequately equipped to sit down and read the AKJV Bible, because it often is difficult to understand. “Truth Gathering” makes it easy and answers so many questions many people have, including me, about what God really requires of us. I have shown this work to my immediate family members, who also are amazed at the depth of the content and the amount of work that must have gone into something so comprehensive! It is on my coffee table for everyone to see. So, it is prominent in my line of view and available to me on the rare occasions I get to sit down for a few quiet minutes on my couch to relax! I plan on ordering copies for my friends and family and hope many other people do the same. I’d been feeling that I needed to work more on my spiritual life. I have been in so much physical and emotional pain and it’s taken it’s toll on me a few times. Still, I hadn’t been doing my devotions like needed and found myself not feeling close to God like I once did. It bothered me; so, I started reading “Truth Gathering.” Oh, I couldn’t put it down! I saw some things in there I had been curious about, like the Dead Sea Scrolls. It was so informative! I had wanted to get the book about the Dead Sea Scrolls; but, the Holy Spirit kept telling me to hold off. Now I see why: “Truth Gathering” answered what I needed to know about them. Oh, how I prayed for the Lord to help me yesterday on the way home. I knew I was going to read more of “Truth Gathering” and even took it with me in the doctor’s office to look through while waiting. What a big ole book of information! I love this book! It’s one that has been needed in the form it’s written! Congratulations and thank you! This book is great and reviews are outstanding. What an impressive study Ms. Quesinberry has done! Just the work in organizing this Topical Bible is to be admired. Very thorough with ALL scriptures provided regarding any subject included in the book! Her concern for mankind and their salvation is obvious. Personally, I feel we are living under grace, if we accept it; therefore, I disagree on some points of interpretation. Author, Bonita M. Quesinberry, in her latest offering, “Truth Gathering: Exhaustive Critical-to-Salvation Topical Bible” has blessed not only the body of Christ but anyone who desires to “rightly divide the word of truth.” From “Knowing Your Enemy”, to “The Dead Sea Scrolls,” and far beyond, Quesinberry has put forth God’s word “decently and in order.” Not only is the book chocked full with critical truths, the author tops it off with poetic offerings for “those that endure to the end!” I strongly urge you to add this to your study materials as you embark upon studying “to show thyself approved,” a workman “rightly dividing” the word of God. The scripture comes to mind that, in the end, knowledge would increase. I submit: the truth has always been present, but knowledge, revelation, and understanding of it are presently being increased. This author has been blessed to play a critical role in that prophecy!